Summer will be here before we know it! In our home those lazy days are full of swimming, gardening and cooling off with a cold treat. I've never had an ice cream machine so it's never occurred to me to attempt recipes of my favorite cold dessert. The other day I happened across a no-churn ice cream recipe on Pinterest and had to learn more. Friends! It is so easy to make - actually too easy to make, my waistline will not benefit from this discovery. I can't wait to attempt more delicious flavors. Today I am presenting Fudge Ripple - a vanilla ice cream with ribbons of hot fudge and bites of white chocolate chips. It's sweet, smooth and full of fun textures. You will love it. 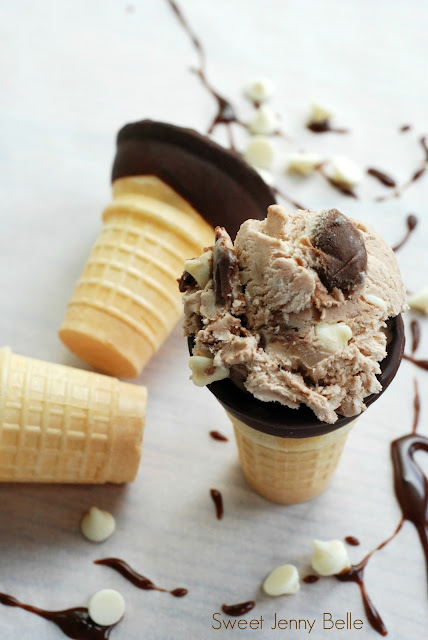 It's delicious paired with a fudge dipped cone and enjoyed outside on the warm patio. Ok, don't be mad, but I'm not writing a recipe for this. I was originally going to do a store bought fudge sauce, but I didn't have any in the pantry. 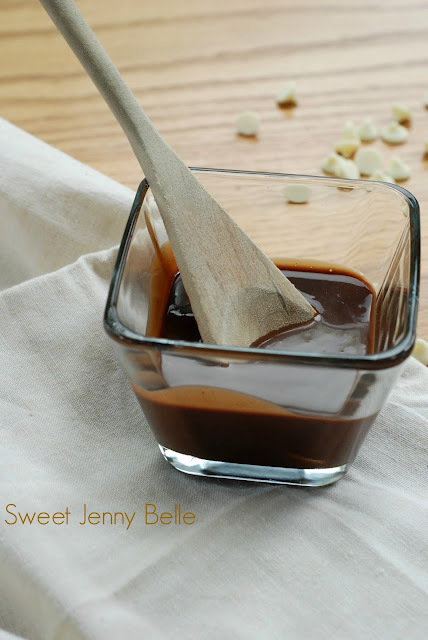 A quick Google search for fudge sauce and I came across this recipe from Carlsbad Cravings. This sauce is crazy smooth, chocolatey and delicious. It takes close to no time. It honestly would have taken more time to drive to the store and buy something that didn't taste nearly as delicious. In the future I may experiment with additional flavors tones - like maybe adding some orange or chili spice, but for now this jar of homemade fudge sauce is crazy good. You will have some leftover, pour into a mason jar and refrigerate. Do you love coffee? And a heaping spoonful of this sauce to your morning mug and you will be in mocha heaven! Now that you've made this delicious ice cream, it needs to freeze for overnight (or at least 8 hours). I've seen all kinds of ice cream storage - cake tins, paper bowls and more. As long as you avoid glass containers, you will be good. I wanted something special for our ice cream though. 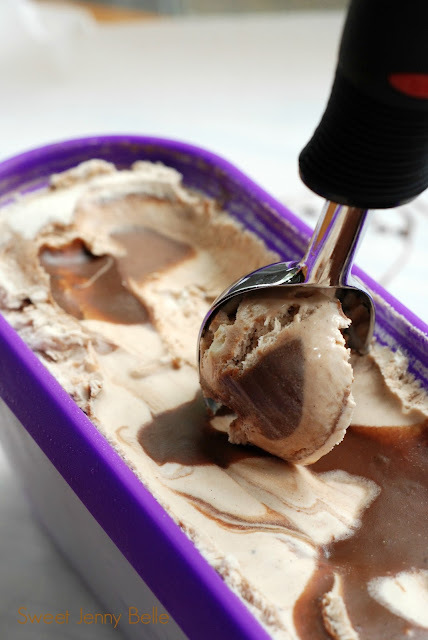 Once I learned how easy it is to make the no churn, I knew that homemade ice cream would become a staple in the freezer. I bought this 1.5 quart ice cream container from SUMO. I adore it! 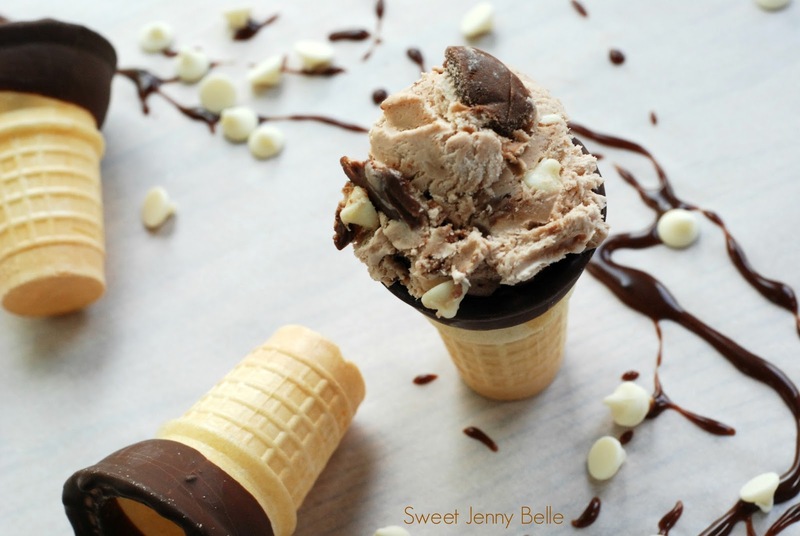 The long slender shape means it takes less time for your treat to be scoopable and it fits perfectly in the freezer. Two dessert covered thumbs up! An easy, creamy delicious no-churn ice cream layered with homemade hot fudge sauce and chunks of white chocolate. Beyond perfect served in a fudge dipped cone. In a separate small bowl, mix chocolate chips and 1/3 cup of fudge sauce with condensed milk. Gently fold condensed milk mixture into the whipped heavy cream. Scoop about 1/3 of mixture into your ice cream container and top with large swirls of fudge sauce. Alternate between ice cream and fudge for two more layers. Now freeze for at least 8 hours. Enjoy! Don't forget to Pin this recipe - I know you will want it for later this summer. There are a million different flavor combos you could invent. I'm playing with a strawberry rhubarb crumble ice cream for later this month. I can't wait to experiment and report back the delicious findings. Look so yum! I'm the kind of person who can eat ice cream the whole year, even in winter, can't wait to try the recipe. Thank you for sharing!